With the Jacksonville Jaguars rookies still using this week to work on conditioning, rookie CB Jalen Myrick is using this time to try and form a nice first impression with the franchise. A seventh round selection out of Minnesota, Myrick mentioned to the Florida Times Union that he’s still trying to pick up schemes and adjust to the pace of the NFL game. 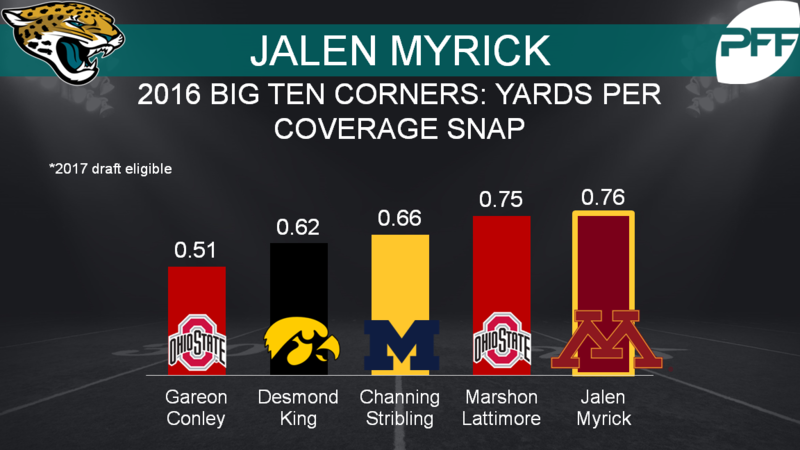 Myrick impressed as a corner during his time at Minnesota. His 0.76 yards allowed per coverage snap was 24th among draft eligible corners while his 17.2 coverage snaps per reception ranked 13th. Partially due to his 4.28 speed he showed in the combine, Jaguars special teams coach Joe DeCamillis mentioned in the same article that Myrick would be a candidate for return duties. Myrick was one of the Golden Gophers’ primary kick returners over the past three years amassing 979 yards on 40 returns for an average of 24.5 yards per return.